The bathhouse change cubicle is half the size of my en suite. Its oppressive walls are the same bland lemon chiffon. The faux marble floor tiles almost match our genuine ones. If I felt better, its clinical seclusion might appeal less. The previous occupant’s lingering Lily of the Valley perfume brings on a sneeze that threatens to blow my head off. Someone taps on the door. ‘You okay in there?’ The familiar voice cuts through the muffled change area noises outside. ‘Yep. I’ll be out in a minute,’ I say, wiping my nose with the back of my hand. Poking my tongue out at my daughter on the other side, I peel both thighs off the lacquered timber seat and re-read the notice taped to the door. The words still make no sense so I poke my tongue at them too and shift my attention to my wasted body. Beneath the stark, fluorescent light, my skin is bleached of all colour, aside from the blue veins snaking up each calf and the red marks tracking down both forearms. The colostomy bag pinches inside my baggy swimsuit. A snug fit on its last outing. I take my time wrapping and tying the white bathrobe. Ali was the one who wanted to come here. ‘It will be so good for you, Mum.’ How often has she said that over the past six months? ‘She’s only trying to help,’ I repeat under my breath before unlocking the door. She helps me out of my robe and guides me to the ramp. No-one laughs at my awkward gait. Unlike the two of us earlier, giggling at a clumsy swan, waddling behind the more fleet-footed ducks and geese competing for Ali’s prize of a few scattered bread crusts. I grip the handrail, flinching at the cold steel against my palm, and wade through ankle-deep water to navigate the steps. I let go and sink into balmy syrup from shoulders to toes. My body sighs as minerals seep through skin and muscles, and the pain leaches from my bones. I tiptoe to the window. The water supports my arms as if I am a bird hovering over a thermal. My feet lift and settle wherever its gentle oscillation takes them. The left deviates too far and I lose balance, almost colliding with a woman in a purple bathing cap. I return her blissed-out smile as we pass, en route to opposite ends. The window frames the still landscape outside. In the fading light, the treetops are burnished by late afternoon sun, their trunks tarnished by shadow. A swirling mass of white against green breaks the spell. Cockatoos on their way home before nightfall. Folding my arms to bolster my head, I close my eyes and breathe deeply. My legs rise and fall with each breath in and out. Their buoyancy gives me a sense of how it might feel to be an astronaut floating in space. Cold air brushes the nape of my neck, bringing me back to earth. When I turn, Ali’s watching, a smile playing on her face. I dog paddle across the pool to join her on the underwater couch. ‘Is that Japanese flute music?’ I ask. We loll in companionable silence until the light catches my knees below the water. We laugh as if my prune-faced knees are the funniest things we’ve ever seen. ‘Shush,’ a passing bather says, reminding us we’re not alone. ‘It’s good to hear you laugh again, Mum.’ Ali’s eyes glisten. She eases off the couch and walks towards the spa end of the pool. Lounging against the tiles, I close my eyes so my thoughts can roam wherever they want. They take me back home to the start of everything changing. The long nights I spent lying awake in the dark, panicking about what was going to happen. One night I realised everyone talks about only living once. But you only die once too. I decided I wanted a good death, a quiet slipping away. Most nights since, I’ve slept well. Before my diagnosis, a rushed weekly phone call was often the best Ali could manage to fit me in to her busy schedule. Career, fitness and social life took up all her time. Now I do. ‘Mum, I’ll do whatever I can to help you beat this thing,’ she told me in the hospital, between fussing with the flowers and cards. I asked her to leave them but she likes to be in charge of things. This morning, we argued about the massage she’d booked for me. It might have helped during the first few months of swinging between denial and anger. Another stranger’s hands on my body at this stage would be more awkward than relaxing. Ali refused to concede and the pretty, young masseuse backed her up. ‘Your treatment,’ she kept repeating, oblivious about the meaning of that word to a cancer patient. In the end, I kept the peace by agreeing to a private aromatherapy bath. It was pleasant enough. I prefer it here though, among other anonymous public bathers. It beats staring at the wall, counting down the lonely minutes. The Japanese flutes end, replaced by the pool’s tranquil symphony of gurgling water. It’s too dark outside to see the trees. I slide from the couch, touch down and tiptoe forward, studying the whorls each step creates on the pool floor. Their fusions and fissions remind me of cells under a microscope. I lift my feet and glide above them, a graceful swan swimming on the lake. I can’t remember the last time life felt this good. I swallow a mouthful of water and go under. I resurface, coughing, and regain my footing. Everyone’s watching Ali. The uniformed attendant kneels on the pool deck and says something only she can hear. ‘Well, turn it up then,’ she demands. Before I can apologise for her rude behaviour, he’s walking away shaking his head. The other bathers resume their vacuous gazes and languid movements. She slaps the water. Its ripples burble over the tiles. The sound bounces off the windows and walls, harmonising with my mood. She smacks the water again and turns to get out of the pool. The door slides open and I follow Ali outside. The chill sets in before I can zip up my jacket. ‘Ali,’ I moan, jamming my hands into the pockets and pulling the padded fabric tighter. It does nothing to stop the shivering. The pain returns, radiating from the base of my spine, down my legs and up into my chest and shoulders. Gail Chrisfield works as a corporate writer and writes short fiction. She lives on Victoria’s southwest coast with her partner and their two furkids. Her voluntary roles as Write Here in Surf Coast Convenor and Writers Victoria’s inaugural Regional Ambassador enable her to meet and encourage other local writers. 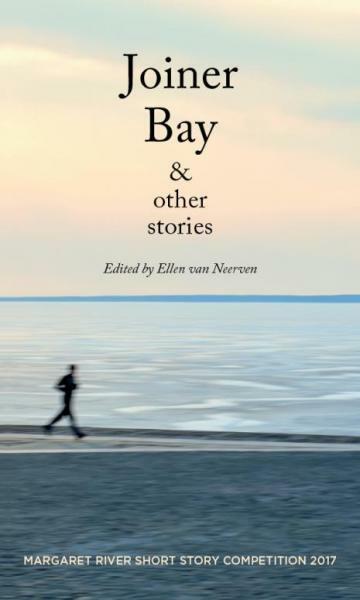 Her story, ‘Still Life with Dying Swan’, appears in Joiner Bay and other stories.